James “Whitey” Bulger refused to look at the relatives of his victims Wednesday as they stood only feet away from him in federal court, offering emotional accounts of the fathers, husband, and sister they loved and the devastating impact of their brutal deaths. 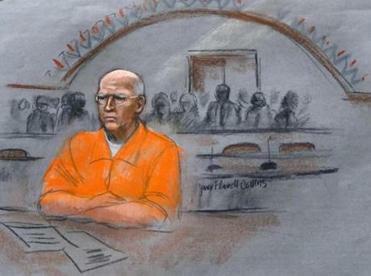 During the 95-minute hearing in the Boston courthouse, Bulger, 84, sat impassively between his lawyers in his jail-issued orange jumpsuit as one by one a dozen people stood at a lectern behind him. He now faces sentencing on Thursday, when he could receive two life prison terms for participating in 11 murders, drug trafficking, racketeering, money laundering, extortion, and other crimes. The gangster sat with his back to the victims’ relatives, even as they called him an evil rat, confessed to wanting to strangle him, implored him to look up, blasted his corrupt relationship with the FBI, and vilified his brother, former Massachusetts Senate president William M. Bulger. Even as Whitey Bulger stands to learn that he will spend the rest of his miserable life in prison, he retains a perverse pride, a diffident arrogance. Bulger, who fled Boston shortly before his 1995 racketeering indictment and was one of the FBI’s 10 Most Wanted, was captured in June 2011 in Santa Monica, Calif. In August, jurors found that Bulger participated in 11 murders while operating a sprawling criminal enterprise from the 1970s through the 1990s that trafficked in cocaine and marijuana; extorted drug dealers, businessmen, and bookmakers; and corrupted FBI agents and other law enforcement officials. He was convicted of 31 counts of racketeering, extortion, money laundering, and weapons possession. Bulger’s lawyers spent much of the trial trying to refute that he was a longtime FBI informant, insisting that his so-called handler, former agent John J. Connolly Jr., fabricated his informant file to cover up the fact he was taking bribes from Bulger and leaking him information. Bulger’s former associates testified that he orchestrated the slayings of three FBI informants after being warned by agents that the informants were cooperating against him. David Wheeler, a Texas businessman, told the court Wednesday that he holds Bulger and the FBI equally responsible for the slaying of his father, Roger Wheeler, who was gunned down in Tulsa, Okla., in 1981 on Bulger’s orders. Wheeler was killed because he suspected Bulger’s associates of skimming from the company, and later FBI agents in Boston thwarted the investigation. Bulger’s lawyers say they will appeal his conviction, arguing that he did not get a fair trial because he was unable to present his claim that a deceased former prosecutor promised him immunity decades ago for all his crimes. Jurors found prosecutors failed to prove Bulger’s involvement in seven of 19 murders he was accused of and were unable to reach a verdict on an eighth slaying, the 1981 strangulation of 26-year-old Debra Davis. Casper allowed relatives of the victims Bulger was not convicted of killing to also speak Wednesday. Davis said he is convinced Bulger strangled his sister. “I hope Whitey dies the same way my sister did, gasping for breath as he takes his last breath,” Davis said. Tom Angeli said he holds Bulger responsible for the 1974 slaying of his father, Alfred Angeli, also known as Notarangeli, even though the jury found it was not proven. Angeli said the Bulger scandal will always be part of Boston’s history and will negatively impact the legacy of the gangster’s brother, William, who resigned as president of the University of Massachusetts after being grilled before Congress about his brother. Tim Connors, whose father, Edward, was gunned down by Bulger in 1975, said Bulger may not have known the importance of a father since his own father reportedly beat him as a youth. “Maybe he knew what you were about to become,” Connors said. Bulger’s brother, John, the only member of his family at Wednesday’s hearing, remained stoic. Edward Connors’s daughter, Kathleen Nichols, said that her father’s slaying traumatized her and her six brothers and sisters. “There is a stigma attached to murder that only the victims’ families know, and it is mentally exhausting,” Nichols said. Sean McGonagle, who was 11 when his father, Paul, vanished in 1974, said James Bulger “stooped to an all-time low” with a taunting call to the McGonagles’ South Boston home the following year. Bulger was convicted of killing McGonagle, whose remains were recovered in 2000. Patricia Donahue said she wanted her husband, Michael, who was gunned down in 1982 by Bulger, to be remembered for the wonderful man he was. She said he loved to cook, though his prime rib was overdone, and assembled bicycles for their sons one Christmas, only to discover the wheels and handlebars were on the wrong bikes. “We were a happy, loving young family with hopes and dreams, and he was the soul of our family,” she said. William O’Brien, who was born several days after his father, William O’Brien, was shot to death in Dorchester in 1973, said the trial, which ended with Bulger being acquitted of his father’s murder, raised more questions and provided no answers for him. The dramatic accounts continued with Theresa Bond, whose father, Arthur “Bucky” Barrett, was killed by Bulger in 1983. “Mr Bulger could you please look at me?,” she asked. Bond paused, but Bulger ignored her plea. Meredith Rakes spoke for her father, Stephen Rakes, who was murdered last summer before Bulger was convicted of extorting his liquor store in 1984.
globe.com. Follow them on Twitter at @shelleymurph and @miltonvalencia.